Originally constructed as a private library, the architecture of Mussenden Temple is modelled on that of the Temple of Vesta in Tivoli, Italy. If you make your way to the top of this sea cliff, you’ll be rewarded with the opportunity to explore this tiny gem along Northern Ireland’s coast, as well as stunning views over the pristine sands of Downhill Beach. The namesake of the Causeway Coastal Route, the Giant’s Causeway is a marvel of the natural world. This UNESCO World Heritage site will blow your mind – 40,000 perfectly formed hexagonal basalt columns stretching out into the sea. This alien landscape was created when molten magma from the depths of the earth came into contact with the sea, crystallising to become the instantly recognisable icon we know today. Legends, however, offer another origin story – these are part of a bridge created by the giant Fionn MacCumhall in his attempt to fight his Scottish rival, Benandonner. Hop on a ferry from Ballycastle and sail to Rathlin Island, just off the coast of County Antrim. Home to about 140 people, the views towards the mainland Antrim coast are simply sublime. Keep watch for seals basking at Church Bay, look out for wading birds roosting on the rocks and listen to the ‘chow’ calls of the choughs as they ride on the sea breeze. After dark, the glowing red ‘upside-down’ Rathlin West Lighthouse is the star of the show. You can’t come much closer to walking on water along the Causeway Coastal Route! 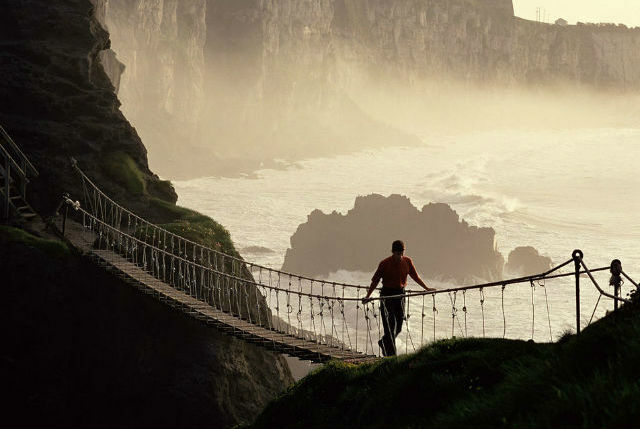 The Gobbins first opened in 1902 as a combination of natural splendour and mechanical engineering, allowing patrons to gaze into sea caves and down to swirling waters along this path bolted to the cliff face. Today, rejuvenated for the 21st century, you can spot fish glint in the waves while exploring the nooks and crannies of this wonderful trail. Perched atop cliffs that tower above crashing waves, the medieval remains of Dunluce Castle were once the seat of the earls of County Antrim in the 17th century. Rumoured to house a banshee (a spirit from Ireland that announces death), approach this once-handsome pile from across the bridge, with the battlements looming above, the wind in your hair and the taste of salt spray on your lips.